That’s no moon, it’s a space station. 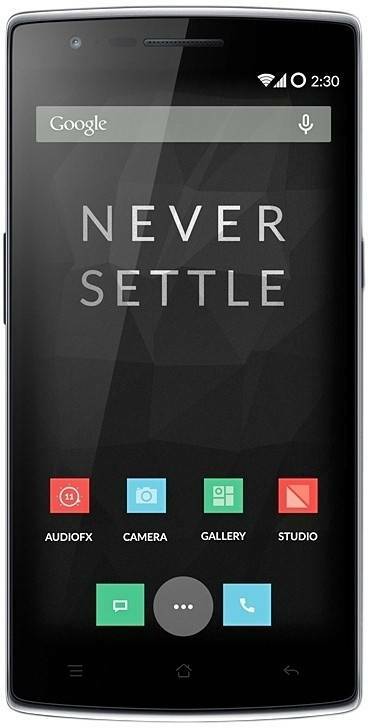 The OnePlus One is the first smartphone developed by new start-up company OnePlus. It was released in April 2014, marketed as the “2014 Flagship Killer”. The device sports a 5.5″ 1080×1920 JDI display. It’s powered by a 2.5GHz Qualcomm Snapdragon 801 processor and 3GB of RAM. Storage comes in at either 16GB or 64GB. Other features include a 13MP camera, 3100mAh battery, dual front speakers and StyleSwap replaceable back covers. On the software side, the OnePlus One runs a version of Cyanogenmod with a unique modified user interface. You can see more detailed specs of the OnePlus One here. he device’s internal hardware includes a quad-core Qualcomm Snapdragon 801 system-on-chip clocked at 2.5 GHz, 3 GB of RAM, and a 5.5-inch, JDI 1080p IPS LCD display. It includes either 16 or 64 GB of non-expandable storage. Its rear-facing camera features a 13 megapixel, Sony-manufactured Exmor IMX214 sensor, alongside a 5-megapixel front-facing camera. The OnePlus One supports LTEnetworks using bands 1, 3, 4, 7, 17, 38, and 40. Due to the company’s startupstature, only one model of the device was released worldwide, without any additional regional SKUs like other smartphones. The chassis of the OnePlus One is constructed from magnesium, and is accompanied by a curved, textured rear cover in either black or white. Special denim, Kevlar, and bamboo wood covers were also unveiled as accessories, but the bamboo covers were temporarily cancelled due to quality issues. The device features capacitive navigation keys, but they can be disabled in favor of customizable navigation keys rendered on-screen. Anandtech characterized its design as being a “close cousin” to the Oppo Find 7A. Outside of China, the OnePlus One ships with CyanogenMod 11S, based on Android 4.4.4 “KitKat”. The latest version of CyanogenMod 11S is 11.0-XNPH05Q. In China, OnePlus One ships with Oppo’s ColorOS distribution, based on Android 4.3 “Jelly Bean”. Alongside additional features added to the Android platform through Cyanogen (including wider customization options, an audio equalizer, encrypted messaging, and application privacy controls), the 11S software adds persistent voice commands, and gestures that can be performed while the phone is in standby to perform various functions, such as double-tapping the screen to turn it on, drawing a circle to go to the camera, and drawing a “V” to activate flashlight mode. An upgrade to Cyanogen OS 12, based on Android 5.0.2 “Lollipop” was released for all OnePlus One devices outside of China on 14 April 2015. The latest version of Cyanogen OS for this phone is 12.1.1-YOG7DAS2K1 based on Android Lollipop 5.1.1(AOSP), released in January 2016. This brings deep integration of “Cortana”-Microsoft’s Digital Assistant into Cyanogen OS due to strategic partnership between MIcrosoft and Cyanogen; Microsoft also being an important investor in the company. Two in-house Lollipop-based distributions, OxygenOS and HydrogenOS, were released earlier, on 4 April 2015, outside and inside China respectively. And on April 9th 2016 OnePlus One devices running Cyanogen OS starts receiving Cyanogen OS 13 based on Android Marshmallow 6.0.1.